Your A.J. Kirby Advent Calendar: What’s Behind Door Number Five? Behind door number five of my advent calendar is another extract from one of my novels, this time from my 2014 publication When Elephants Walk Through The Gorbals. You can download the novel from Amazon here. It started with the mocking peal of laughter; three girls on the back seat chuckling and pointing, as girls do, enjoying their giggling sisterhood. They plotted and schemed as though they were witches, toiling, toiling over their troubled cauldron. He was standing directly in their eye-line, holding on to the strap from the overhead pole as the bus lurched through the streets as Glasgow. When the articulated brakes cut in, he fell, face-first into the passenger in front of him, jarring his teeth together. This only seemed to increase their mirth; they were openly laughing at him. Obviously, they were laughing at him for the way his rigid posture wasn’t designed for travel like this, or for his beak-like nose, or for his acne scars. Obviously they were laughing at him because he seemed weak. He knew that he looked like the type of guy that didn’t have any friends, and that had become a self-fulfilling prophecy. He knew that he looked like the type of guy that the local vigilantes would first suspect if a child went missing. He knew this because it had happened, and he’d had nothing to do with it. Nevertheless, laughter and mockery gradually became suspicion and fear – he knew the script. With these three girls it was simply taking a shorter time to happen. It seemed that one of them had taken against one of his shifty backwards-glances at them – those surreptitious, stolen looks that he thought nobody ever noticed – and their laughter had now turned to contempt, just like the pouring rain outside now being accompanied by thunder and lightning. He stared resolutely out of the window and hunched his shoulders down, trying to appear smaller, and surely not the object of the girl’s wrath. But other passengers started to look round at him; the woman in front, who he’d crashed into, actually tutted under her breath in scarcely veiled disgust. “You way the piggy eyes… yeah, you,” the girl continued. Her heavily made-up face was now contorted into that of a rabid, snarling dog. He continued to stare out of the window at the bouncing rain, hoping against hope that if he remained quiet then they’d finally get the message and ignore him. “You pervert,” yelled the second girl, encouraged by her friend’s bravado. His eyes stung; he knew what was coming next. He closed them to try and delay the inevitable. A thunderclap cracked through the sky, evidently very close by. “Aw; he’s greetin’ now,” laughed another of them; he couldn’t see which, and he didn’t care any more. Suddenly, he felt a hand on his shoulder. Fearing that it was one of the girls, he kept his eyes clamped shut. The conductor! What was he getting involved for? Oh, God, now the bus had stopped. He gingerly opened his eyes to see the elderly conductor staring at him with a mixture of concern and loathing. The conductor was a big man; probably a former docker put out to pasture on the buses. He was a man of action, clearly – his sleeves were rolled up to reveal a myriad of tattoos. “Umm – no – nothing,” he stammered. He always seemed to stutter when he was nervous. And now, other passengers were becoming restless. The bus hadn’t stopped at traffic lights, as he’d hoped, but instead had pulled over at the side of the road. There was a zero tolerance of any kind of potentially violent scene on Glasgow buses these days. “He’s been looking up Molly’s skirt!” yelled one of the girls. Again, he didn’t know which. To him, they were all composite parts of that same screaming mass which he faced every day. “That true?” asked the conductor. He’d dropped the ‘sir’ now. “I think you’d better get off the bus,” said the conductor, clasping his arm tightly and dragging him down the aisle towards the exit. He was unceremoniously dumped at the side of the road and he swore he could hear the haunting cackle of the girls as the bus accelerated away. The Gorbals! A name to strike dread into the meek of heart. But at least he knew where he was. The Palace Theatre and the Citizen’s Theatre stood side by side; cultural book-ends, remnants of what the area used to be – a thriving theatreland. Rain ran off the awning and battered down onto his head. He pulled his mackintosh close around him and darted underneath it, cursing his ill luck. For the evening was cold, and very, very wet. It was the kind of climate which suggested that Noah’s Floods were not only a possibility, but a probability. The streets were becoming minor rivers; drains had given up the ghost and were now only contributing to the water’s flow. Thunder and lightning still provided the background noise. He looked through the windows of the Palace while he struggled to light a cigarette. His hands were already damp and wrinkled, the matches suddenly more liable to break when he tried to strike them. Finally the cigarette was lit and a satisfying fog of smoke filled his lungs. Only now did the acidic hatred stop eating away at his stomach. Absent-mindedly, he stared through the windows of the theatre. The interior looked weirdly out of place; great stone elephants and angels like the acts in some otherworldly circus. They suggested some higher plane than the humdrum, rainy Glasgow of 1976; they suggested that grandness and beauty could still be achieved; that amid all of the despair, there was some hope. Elephants! In the Gorbals! Incredible, come to think of it; he felt his whole spirit uplifted by the strange incongruence. The sight evoked strong memories for him; memories of a better time, a simpler time. “Wonderful, aren’t they?” said a voice from behind him. He’d not noticed that there was anyone else around, another person sheltering from the storm. “A true wonder of the world,” he agreed, surprising himself with his decision to respond to this man. The stranger was a short, slightly-built man of indeterminate age. His hair was closely cropped and his face was almost wholly taken up by a very distinguished looking nose. “Are you an actor?” he asked, already knowing the answer, because this stranger had a presence to him, and innate attractiveness which belied his size and unfortunate nose. 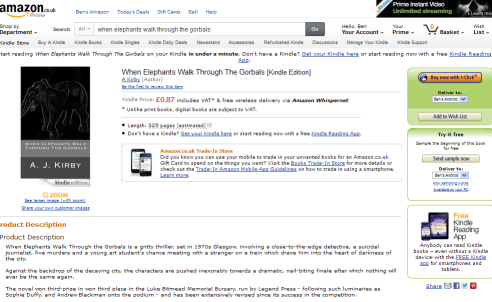 Amazon carries another excellent review of my selling-like-hotcakes 1970s crime-thriller When Elephants Walk Through The Gorbals this week. Couldn’t make the Big Bookend Festival in Leeds at the weekend in order to watch me in ‘The Conversation’ with Richard Smyth or to pick up any of the signed, discounted COLLECTOR’S EDITION copies of my novels? Well never fear because I have a limited number of books STILL AVAILABLE for purchase at an AMAZON BUSTING price of £7 INCLUDING P&P (to UK destinations). If you’d like to take advantage of this incredible offer, please email me (andrewkirby (92) @ btinternet.com) and I’ll provide purchase information. Payments can be made by Credit or Debit card or by Paypal. 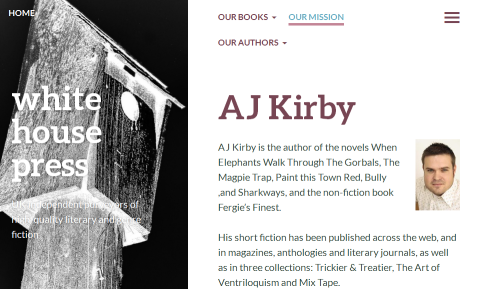 The books on offer are Bully, When Elephants Walk Through the Gorbals, The Art of Ventriloquism, and Paint this Town Red. With When Elephants walk through the Gorbals on the starter’s block, ready for release, this week we’ve been revisiting the first book in the JIM HUNTER series, The Magpie Trap, a book which was very well received by fans and critics alike. Remember, The Magpie Trap is still free, here. “Three men, all involved in the security industry, are manipulated by a sinister and secretive figure into undertaking a high-tech heist on a printing works. Their prize – a printer which can produce legal tender for any country in the world – seems to represent everything they’ve ever dreamed of. But the group is gradually torn apart by the failings and insecurities of its members. 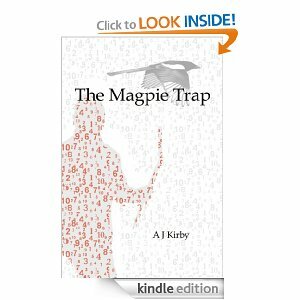 “The Magpie Trap” is a great piece of contemporary British Noir, set in the urban jungle of the partly-regenerated centre of Leeds. The “magpie trap” of the title refers both to an exceptionally nasty piece of gamekeeping, and the fatal attraction that society’s shiny things have for the book’s three central characters. As we watch the three flawed but likeable men losing everything they value in their quest for riches, we’re drawn deeper into the hollowness at the heart of their dreams of success. This could have been an incredibly bleak story, and its ending is certainly very dark, but there’s also a lot of humour along the way – including some great cameos from hideous bosses, embarrassing parents and irritating clients. The dialogue is sharp and funny (think Shallow Grave andTrainspotting) and the sense of place is fantastic (if you know Leeds, you’ll recognise it; if you don’t, you’ll feel as if you’ve been there). Like all good thrillers, it’s driven by character rather than events. The downfall of the three thieves is inevitable not because of what they do, but because of who they are. The final revelation is highly satisfying, and wraps up a fast-paced story with a suitably high-concept thought that leaves the reader wondering whether they’d behave any differently. To celebrate the forthcoming release of When Elephants Walk Through The Gorbals, the first novel in the series, The Magpie Trap is available for FREE from today up until Monday 14th April. 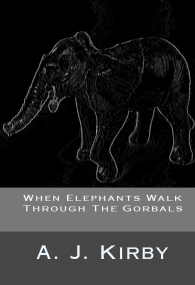 And keep watching these pages for more updates on the release of When Elephants Walk Through The Gorbals, which will soon be available in paperback and ebook versions.